News in brief: March 2019 – European Bioplastics e.V. On the recently launched report New plastics economy global commitment by the Ellen MacArthur Foundation, Burberry reveals its planned efforts to tackle plastic waste. In the brand’s commitment to use 100% reusable, recyclable or compostable plastic packaging by 2025, Burberry will ensure that that retail bag rain covers are made from at least 30% bioplastic and will be compostable by the end of 2019, launch a compostable hanger option by the end of 2019, and a compostable shroud and polybag by the end of 2019. The brand has also started to explore options to develop a fully compostable and 100% bio-based material to be used in its transit packaging items by 2025. The long-term goal of the bioeconomy is to reduce the fossil material and energy consumption and at the same time to substitute it with renewable raw materials. Therefore, the policy strategy addresses all relevant actors in the provision of raw materials (agriculture and forestry, water management and waste) and resource use (food and feed, chemicals, materials, energy). An action plan will be developed by autum 2019. For a lasting change of the economic system, the reduction of the total resource consumption has to be intended. In order to be able to exploit the associated potentials, a change in consumption habits and a strengthening of the circular economy should also be aimed for. 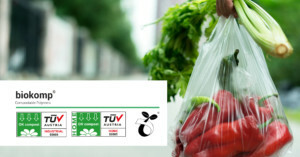 Kompuestos® has been awarded the “OK Compost” conformity mark by TÜV Austria for several of its Biokomp® grades. Biokomp® resins are thermoplastic biopolymers with similar properties to conventional plastics and completely compostable. These are specially designed for single-use applications (shopper bags, refuse bags, fruit and vegetable bags) and films with a difficult collection system.